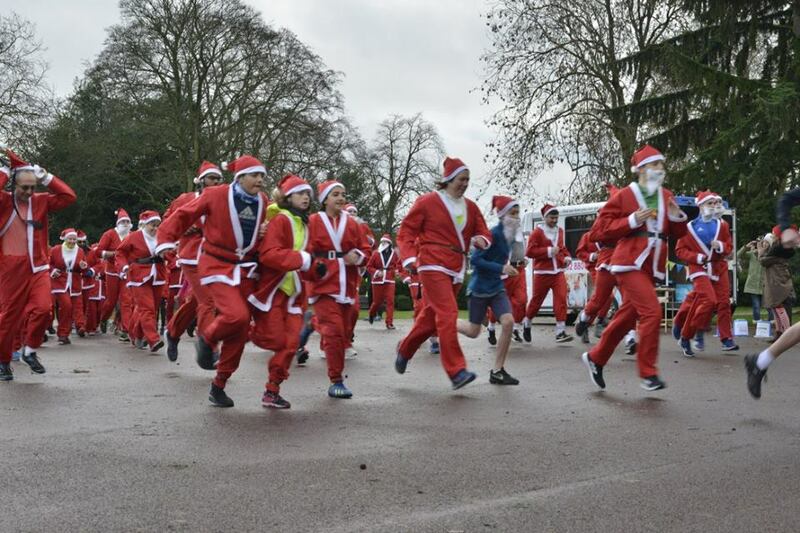 The annual Santa Run to raise funds for local sight loss charity, Beacon, proved a huge hit with over 140 Santas braving the wet weather to complete the 5K challenge around West Park in Wolverhampton. The runners, including children, were also joined by Councillor Hazel Malcolm, Cabinet Member for Public Health and Wellbeing for Wolverhampton City Council, who also said a few words before the start of the race. Wolfie, the Wolves F.C mascot, was also on hand at the starting line to complete the challenge. Gurinder Atwal, community and events fundraiser, said: “It was amazing to see so many people take part in this year’s event. The Santa Run is a fun event, but we also aim to raise awareness of the vital work we do at Beacon. Some runners wore blindfolds and were guided by friends to experience living with sight loss. All those who participated helped raise a great deal of money and awareness for which we are very grateful.” . Steve Titley from Sedgley who participated in this year’s run, added: “Despite the weather, spirits were not dampened. Dressing as Santa and running around the Park was fun for all. I know the vital work Beacon do in our community and this was the ideal way of giving something back and raising some money.